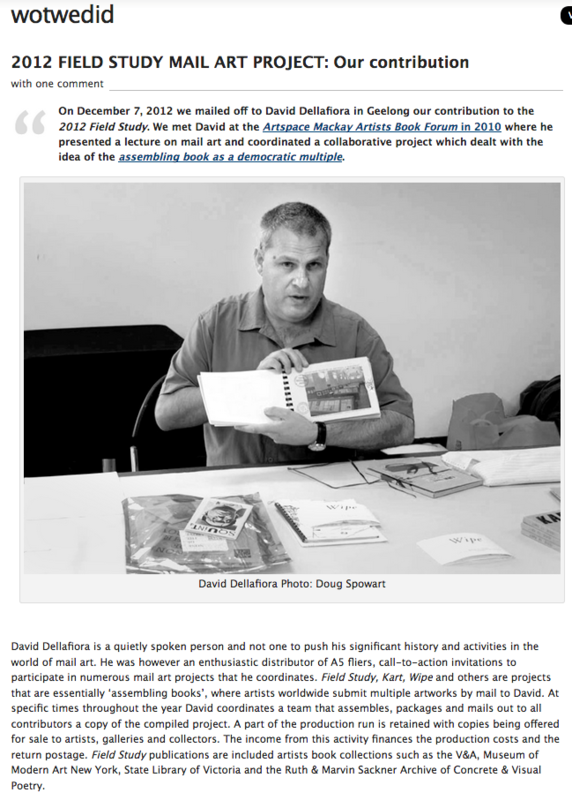 As an important end of year ritual, we have once again prepared our submission to the ‘FIELD STUDIES INTERNATIONAL’ collaborative mail art project organised by David Dellafiora. Artists from around the world contribute to this project by mailing to David 100 artworks of any process and printed media made to A5 size. He then works with a team to collate all the submissions and assemble 100 copies of the collaborative book. After each participant receives one of these books, a number are then sold to private and institutional collectors to fund the project. We have contributed to the Field Studies for the last 10 years. Some links to the previous submissions are provided at the end of this post. In 2000, we began a series of site-specific camera obscura projects that is a continuing body of work… This year we made two attempts to construct a cabin camera obscura. The second attempt proved more successful and so in this blog we present this recent work – Through a porthole in 3-5metre seas on the The Spirit of Tasmania. On the morning of the 3rd of November we boarded the Spirit of Tasmania and checked in to our cabin for the nine-hour day crossing. We had booked months earlier and had requested a porthole cabin with the idea of making a camera obscura. Earlier in 2018 we had tried unsuccessfully to make camera obscura images on an overnight crossing figuring that by the time we boarded the ship we would have a brief period of sunlight – alas, that would not be the case it was dark by the time we had boarded and checked into our cabin. This second time we worked it differently with a day crossing and a porthole cabin… we then prepared for a full day of camera obscura work. 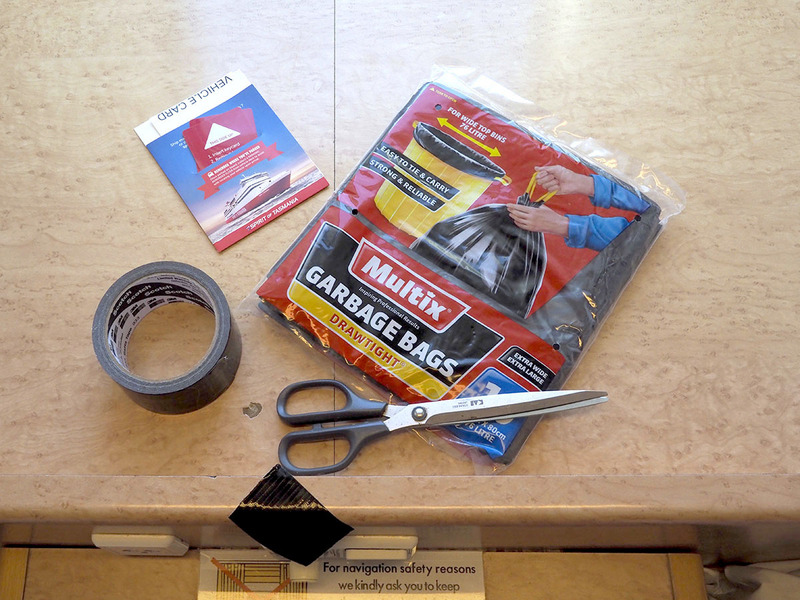 Vicky documented Doug as he negotiated the space beyond the bunks to tape the black bags over the window. Progressively the room got darker and glimpses of the features outside our little cabin imaged themselves on the walls of the cabin. One problem was the darkening down of the central image area caused by depth of the room and a mirror on the reverse of the door. We decided that to create an observable image we needed re-purposed two white doona covers as a screen by taping them to the ceiling and walls with the gaffa tape. To recreate the theatrical space of the cabin camera obscura, we combined a series of images of the cabin walls and the screen at different stages of the journey. We also found our humble Olympus Pen camera set at ISO25,000 the best option as it fitted the small space and enabled hand-held exposures. The Spirit of Tasmania left Devonport port and headed out into Bass Straight. For us this was a challenging crossing as there were strong westerly winds and huge 3-5 metre waves for most of the day. It wasn’t long before we began to experience the ‘bang’ and ‘splash’ of waves over our porthole… we were on one of the upper decks – deck 8!!! Kwells (anti-seasickness pills) were taken and to take our minds off the thump and roll we got active documenting the CO crossing. Two composite images were constructed from our work that day that we entitled Through a porthole in 3-5 metre seas on the The Spirit of Tasmania. The first is a panorama that shows Vicky on her bunk looking at the projected camera obscura image. On the right-hand side the shadow of the camera held aloft is imaged. The final panorama is made of 4 images. The second image is a triptych of the projected image on the screen showing a series of three photographs made by Vicky as the boat rocked with the centre image documenting a whiteout as a wave crashes on the window. We left the camera obscura setup until we docked. Midway across Bass Straight the images described above we assembled and optimised as the ‘bang’ and ‘whoosh’ of the waves on the boat continued incessantly. At one stage we ventured out to see how those brave souls in the public areas of the ferry were managing… they all looked pretty green–some not well at all, and many finding any horizontal space they could to find some comfort. When the Spirit docked we dismantled the CO and disembarked, glad to be on terra firma again. We have been busy the last few days completing our contribution to the 2016 Field Study International report project. Led by David Dellafiora in Geelong the Field Study project is now in it’s 22nd year. Field Study Report contributions are called emanations and can include all kinds of things including: ‘documentations of performances, actions and exhibitions, tracts, rants, instructions, manifestoes, reflections and experiments.’ They are a mashup of Fluxus, DaDa, Surrealist inspired, zine-ish paste-up, rubber stamps, torn up letter ransom notes and concrete poetry. The Field Study Report becomes a snapshot of artistic, social and/or political commentary at the time of its publication. Our submission for 2016 is a commentary on our present nomadic lifestyle. Since moving from Toowoomba 2½ years ago we have been house-sitting, doing artists in residence projects, staying with friends and renting – we have lived in approximately 15 places. For our submission we made a diptych of original cyanotype images recently while staying on the beach at Wooli. One print represents a starry night above a line of houses. 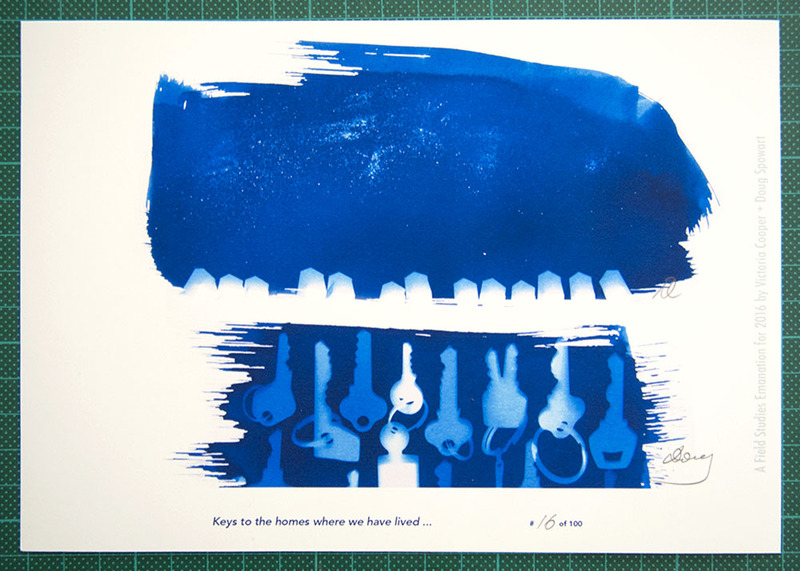 The other print is a selection of of different keys –referencing all the houses we have stayed in. The two cyanotype prints were copied, scaled and arranged on the one sheet with the captions: ‘Keys to the homes where we have lived …’ and, ‘A Field Study Emanation for 2016 by Victoria Cooper + Doug Spowart’. 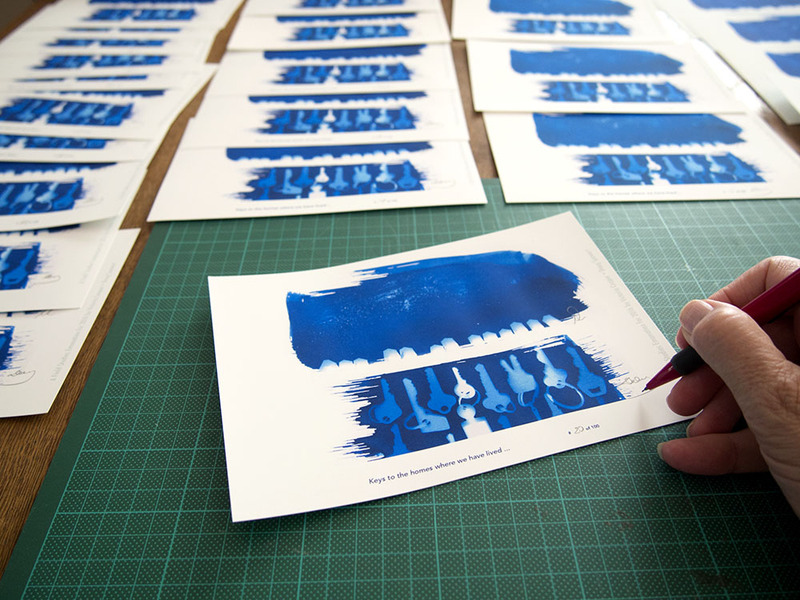 Each A5 print is numbered and signed and the edition is 100. 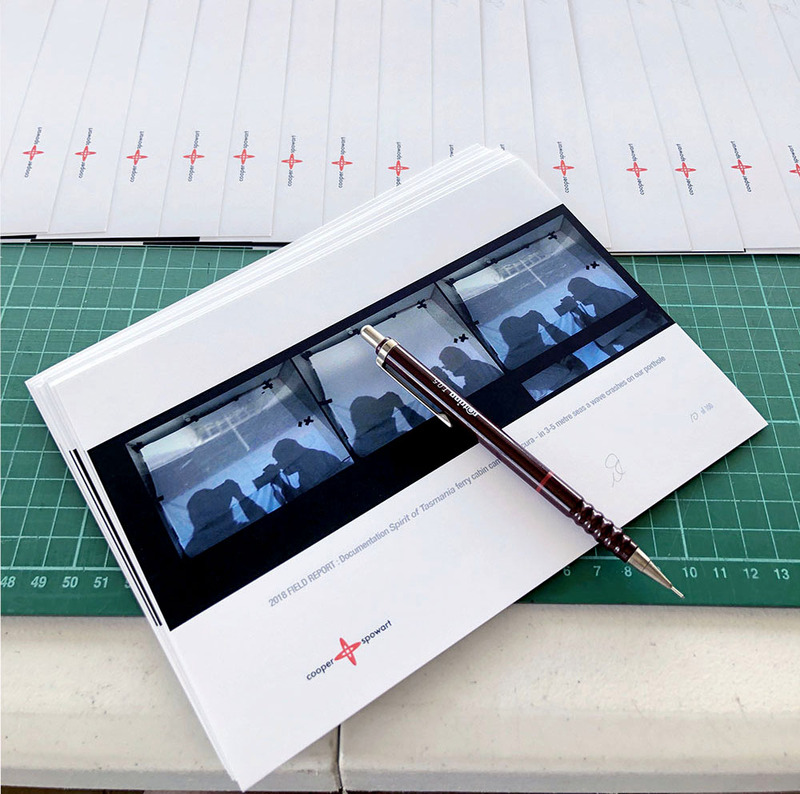 Each contributor gets a copy of the assembled works and some copies are sold to support the project and the group that helps make it happen. Field Study began in 1993 as a way of reclaiming the negative spaces between art and life. Activities stemming from Field Study are emanations and group emanations are manifestations. Field Study sees each work as a manifestation of a collective spirit. 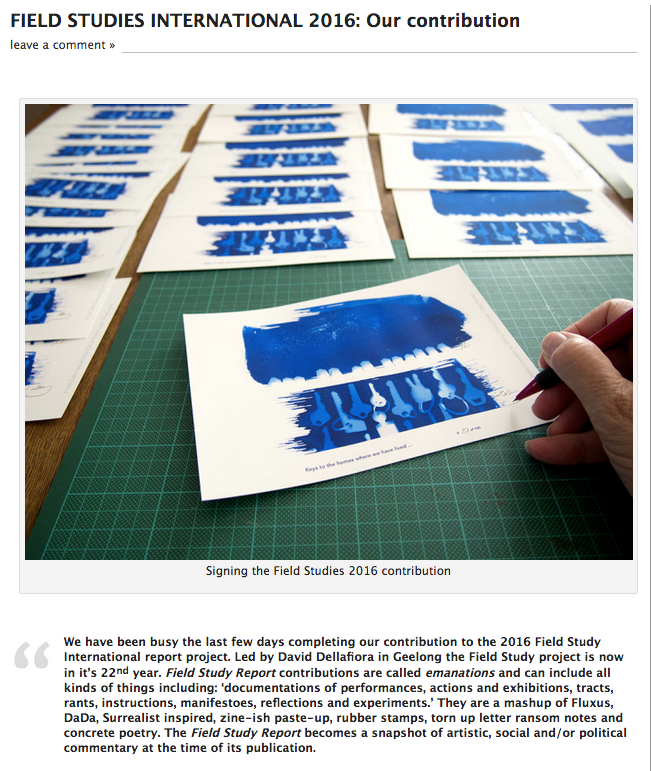 Everyone is welcome to become a member of Field Study, irrespective of their arts practice, and contribute to the Field Report. Field Study also produces the assembling publications WIPE and ReSite, and, in collaboration with Karingal, KART.